You can help leaders who do not have direct reports reach their full potential by using a performance assessment that provides clear, measurable information on how effectively they use their competencies in the nine leader competencies crucial to working well with peers and managers. The leader and his or her peers and boss need only 10 minutes to provide information that allows you to create a benchmark to focus leadership training and development initiatives so that the leaders in your organization reach their full potential. The ABLE family of assessments, the first 360° leadership assessment designed with a post-assessment specifically keyed to each question, includes an ABLE-P (Post) that corresponds question-to-question to the ABLE-S, ensuring that you compare apples to apples. For that reason, the ABLE-P evaluates the effectiveness of your leadership intervention or coaching to ensure that those interventions establish meaningful Impact Data. The ABLE-S and ABLE-P (click here) give you all the tools you need to provide accurate and meaningful leadership measurement, to design effective training and development initiatives, and to measure the effect of those initiatives. For more on Applications, click here. How Does the ABLE-S Work? The ABLE-S is easy to administer. The leader, leader’s boss and peers complete questionnaires about their perceptions of the leader’s performance on nine core competencies that are unique to leaders who do not have direct reports. This produces a comprehensive, 360° view of the leader’s effectiveness and forms the basis of a Leader Effectiveness Action Plan for future development. Individual responses of peers remain anonymous and are shown as averages only. Confidential feedback is provided to the leader in a non-threatening, easy-to-understand format using simple graphs and rich narratives. What Does the ABLE-S Assess? Despite the underlying robustness of the assessment, the ABLE-S report itself is easy to read and understand. Unlike most 360° assessment reports, the ABLE-S is not full of confusing statistics that busy supervisors and managers may not have time to read and interpret. Bar graphs allow participants to comprehend the most important information in seconds. 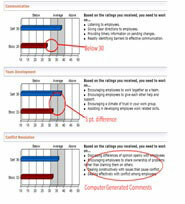 Computer-generated comments based on raters’ responses give additional feedback that allows the leader to understand his or her results more completely. Narrative paragraphs following the graphs explaining what numerical scores mean in terms of leader performance. Comments written by raters can be given to the leader or used by the feedback specialist to guide feedback discussions and Leader Effectiveness Action Plans. In addition to clear and informative results, the report also includes examples and explanations of graphs and comments, advice on how to conduct follow-up meetings with bosses and peers, and a Leader Effectiveness Action Plan to help staff leaders make the best use of the ABLE-S as a 360° leadership developmental tool. Online HPS Portal for quick and easy administration, scoring and more. Online administration is fast and easy to use, and support is available to all account managers. The online account can be customized with a client logo, providing a professional assessment management system for corporate accounts or independent consultants. The account manager can log in at any time to set up assessments, monitor completion or process reports. High Performing Systems offers online certification on the ABLE. These interactive, research-based classes prepare you to administer, interpret and give feedback on the entire ABLE family of assessments. You begin by taking the ABLE or ABLE-S and receiving feedback (if applicable). Next, you participate in 5 Certification Sessions and read the ABLE Technical Manual. After setting up an Online Account with HPS, you begin the final step by arranging for a friend or colleague to take the ABLE or ABLE-S using your online account and providing feedback. 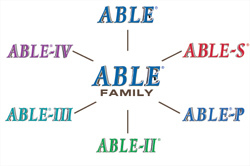 For information on ABLE certification, click here. Contact HPS at 706-769-5836 to get started.